Perrotto: Winter Meetings Buzz: Could Paul Maholm be traded? LAKE BUENA VISTA, Fla.—Could Paul Maholm be traded? Pirates general manager Neal Huntington made it sound like that is a possibility on Tuesday during baseball’s Winter Meetings at the Swan and Dolphin Resort at Disney World. Huntington said he would consider trading one of the Pirates’ established starting pitchers if he could improve the team. 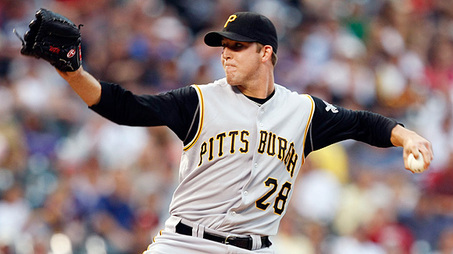 Maholm, a left-hander, is the only member of the Pirates’ rotation who could be considered an established starter as he made his major-league debut in 2005. The Pirates have reached an agreement with free agent right-hander Kevin Correia on a two-year, $8 million contract, pending a physical examination. However, baseball rules prohibit players signed as free agents from being traded until June 15. The Pirates would be selling low on Maholm as he went 9-15 with a 5.10 ERA in 32 starts last season. He set a career high for losses and his ERA was the worst of his career as was his hits (11.1), walks (3.0) and strikeouts (5.0) per nine innings. Maholm will be eligible for free agency at the end of next season if the Pirates do not exercise a club option for 2012 in his three-year, $14.5 million contract. In addition to Correia, the Pirates have also come to terms with free-agent left-hander Scott Olsen on a one-year deal worth a reported $1.5 million. While the Pirates are banking on Olsen showing that he is completely recovered from 2009 shoulder surgery, he would give them another starting option if healthy. Meanwhile, the Pirates have expressed interest in left-handed hitting outfielder Brad Hawpe. While the Pirates are looking for a right-hander to platoon with switch-hitting Ryan Doumit in right field, Hawpe would provide depth at the corner outfield spots and first base as well as a power bat off the bench. Hawpe, 31, played for Pirates manager Clint Hurdle with Colorado and averaged 25 home runs a season from 2006-09. However, his production dipped dramatically last season as he hit a combined .245 with nine homers and 44 RBIs in 103 games with the Rockies and Tampa Bay.